The first month of each quarter is typically a bit of a let down after the large payout from the end of quarter month; however, I have no complaints with how April turned out. My FI Portfolio produced $304.67 in dividends during the month, which was the first time a non-end of quarter month achieved that since August 2016. My Folio First account chipped in another $5.79. My Roth IRA added $39.10 as well. Combined the 3 portfolios produced $349.56 during April. As I mentioned above my FI Portfolio produced $304.67 in dividends last month. The quarter over quarter comparison showed an excellent 10.5% increase. Although a good chunk of the increase was due to the timing of payments rather than dividend increases. Normalizing the dividends received across both time periods shows a still strong 6.7% increase. The year over year comparison gives a better look at growth since most companies maintain the same payout month from year to year. Compared to April 2017 last months dividends showed a solid 8.6% increase and that's with including General Electric's (GE) 50% dividend cut late in 2017. April was another solid step forward for my Roth IRA in terms of dividends. During the month my Roth IRA generated $39.10 in dividends. Compared to January 2018 that's a modest 0.7% increase which is thanks to dividend reinvestment alone. Looking back at April 2017 last months dividends showed a 10.9% improvement solely from dividend reinvestment and dividend increases. The pay raises just keep on coming. 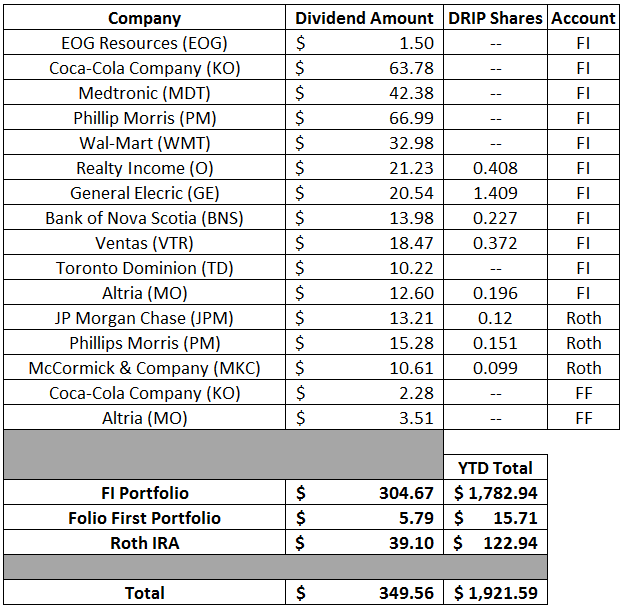 April was a solid month for dividend increases with 5 of the companies owned in my FI Portfolio announced pay raises. You mean a company I own a piece of, albeit tiny, wants to pay out more of their profits to me just because I own part of the company? Sign me up! That's 5 different pay raises in April alone compared to a big, fat zero from my day job. Combined those 5 companies increased my forward 12-month dividends by $52.99. Even better is that the raises came from wide variety of industries: consumer staples, health care, technology and oil. Through the first 5 months of 2018 there's been 24 announced raises from 23 of the companies that I own combining to increase my forward 12-month dividends by $214.68. My forward 12-month dividends for my FI Portfolio ended March at $6,190.06 while my FolioFirst forward dividends are at $79.05. That brings the total taxable account forward 12-month dividends to $6,269.11 My Roth IRA's forward-12 month dividends ended the month at $338.52. Across all 3 accounts, assuming no dividend cuts or position size changes, I can expect to receive at least $6,607.63 in dividends over the next year. The rolling 12-month monthly average for my FI Portfolio is at $484.11 per month which is a solid $11 above 2017's monthly average of $473.37. This should continue to increase throughout the year assuming no dividends cuts. 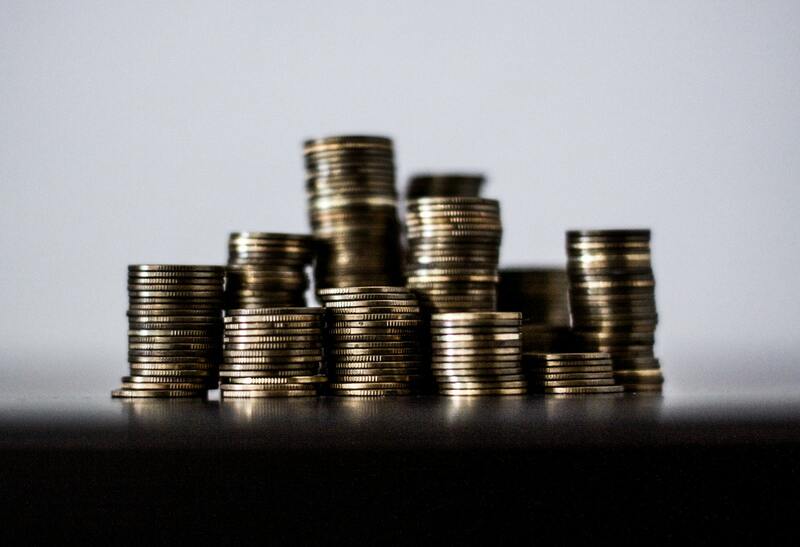 I've updated my Dividend Income page to reflect April's changes. With the first quarter in the books how are you doing on your goals for the year? Congrats on having a solid month of dividend income. Our goal for this year is $18,000 in dividend income. Looks like we might be on track for achieving this goal. It was a solid month but nothing spectacular. I'm hoping that April 2019 looks a lot better as we will have another year of dividend growth behind us and hopefully several months of regular investing as well. An $18k goal is awesome and admittedly I'm a bit jealous to see that kind of number. In time we'll get there though. Congrats on this great month PIP! You're crushing it and I hope you enjoy every single one of those dividend increases. It has been fun watching your growth during the year and I can't wait to see what else you have up your sleeve for 2018 . Keep it up. I love every dividend increase no matter how big or how small. The rest of 2018 will primarily be focused on debt reduction although I think we should be done with that by early Q4 and then hopefully get a couple months of investing heavily once more. That is one solid month with a great group of companies paying you out. The amounts are something very very far in my own investing future, buts its great to sse what someone can accomplish over time. Given time and most of all consistent saving/investing you'll get there.